In the immediate aftermath of the Charlottesville violence, several prominent figures—including CNN anchor Chris Cuomo and Jeffrey Goldberg, editor-in-chief of The Atlantic—equated left-wing “Antifa” activists with the thousands of Allied soldiers who stormed Normandy’s beaches to invade Adolph Hitler’s “Fortress Europe” on D-Day. A more appropriate equation would be with the thousands of soldiers in the Red Army, who brutally marched toward Berlin, where they would establish Soviet hegemony in the so-called German Democratic Republic after defeating Hitler. Antifa returns to the news this week. On Tuesday night, former Breitbart.com editor Milo Yiannopoulos spoke at California State University, Fullerton in a program sponsored by that university’s College Republicans. Seven were arrested amid reports of head-punching and pepper-spraying. Protesters of the event chanted “Cops and the Klan go hand in hand!” and held signs reading “Only socialist revolution can defeat capitalist reaction.” In February, Antifa militants committed such mayhem while protesting Yiannopoulos’ appearance at the University of California at Berkeley that university officials cancelled his speech at the last minute. Despite antiseptic portrayals throughout American media, Antifa are more than “anti-fascists.” Antifa represent the chaos of Germany’s Weimar Republic and provide the violent complement to academic neo-Marxism. Like their philosophical comrades, Antifa seek to destroy the American emphasis on liberty under law and to impose a revival of one of history’s most repressive ideologies. Short for the German phrase, “Antifaschistische Aktion,” Antifa served as the paramilitary arm of the German Communist Party (KPD), which the Soviet Union funded. In other words, Antifa became the German Communists’ version of the Nazis’ brown-shirted SA. The KPD made no secret of Antifa’s affiliation. 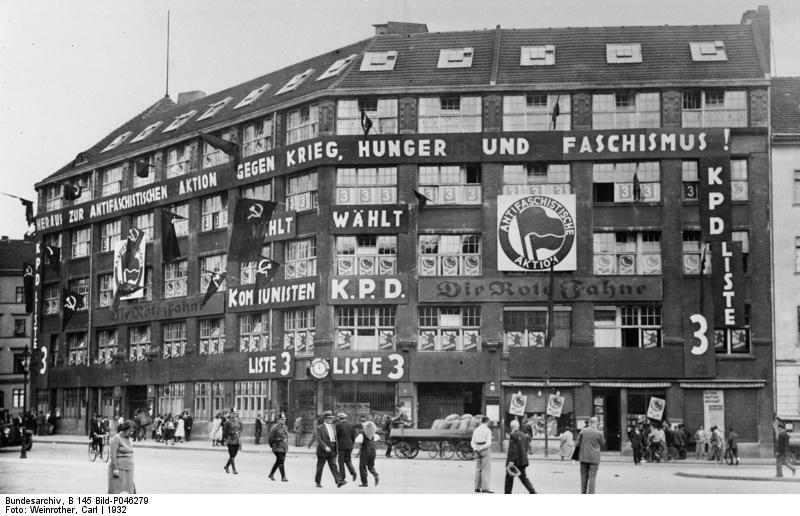 A 1932 photo of KPD headquarters in Berlin prominently displayed the double-flagged Antifa emblem among other Communist symbols and slogans. In a photo from the 1932 Unity Congress of Antifa in Berlin, the double-flagged banner shared space with the hammer and sickle and with two large cartoons. One supported the KPD, the other mocked the SPD, Germany’s Social Democratic Party. Today’s Antifa embrace those roots. During February’s protest in Berkeley, masked Antifa agitators caused nearly $100,000 in damage by starting fires, breaking windows, assaulting bystanders with pepper spray and flagpoles, painting graffiti on nearby businesses, and destroying automatic teller machines. “Refuse Fascism,” the group organizing Saturday’s protests, is controlled by the Revolutionary Communist Party USA, which seeks to create a Marxist United States through violent revolution. K-Su Park, a University of California at Los Angeles law fellow, reflected Marcuse’s thought when in an op-ed in The New York Times she challenged the American Civil Liberties Union to reconsider its approach to the First Amendment. The ACLU represented Jason Kessler, who organized the “Unite The Right” rally and sued the City of Charlottesville for revoking his permit for the protest. Park’s fellowship is with UCLA’s critical race studies program. Critical race studies comes from critical theory, a sociological approach developed by Germany’s neo-Marxist Frankfurt School, where Marcuse was a leading thinker. Johns Hopkins professor N.D.B. Connolly blended Marcuse’s philosophy with Antifa’s militancy in a Washington Post op-ed, where he compared the United States’ racial history to a game of rock-paper-scissors. Connolly concluded by advocating similar measures. “Segregationists have again assumed their pedestals in the Justice Department, the White House and many other American temples,” he wrote. ”Paper alone won’t drive them out. Start throwing rocks.” In slandering those who hold opposing views, and in essentially calling Martin Luther King Jr. a failure, Connolly reflected the true “Antifa” spirit: Neo-Marxism über alles. This entry was posted in Communism, crime, leftist bullying, liberal intolerance/persecution, liberals, Marxism, neoliberals and tagged Antifa. Bookmark the permalink.